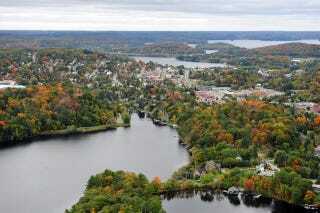 That's Huntsville, Ontario. National Geographic's #1 travel destination in 2011. The 36th G8 summit was held there, bringing the world leaders to this quaint little town. Survivorman lives there. And that's where I'll be going in a month's time! Excitement level rising. My mother's family has owned land on a lake up near Huntsville for a long time. My grandfather went up there when he was young, my mother when she was young, and of course, myself, when I was young. It's nothing fancy by any means. There's a trailer, a dining shelter, and a small bunkie. We have a nice fire pit, with large stones around it, and an old yellow canoe to tour around the lake and go fishing if you're into that sort of thing. There's going to be a whole bunch of us. Myself, my wife, my two brothers, and a handful of good friends. We'll hang out around the fire, have some drinks, play some Cards Against Humanity. We'll probably end up playing a game of "Manhunt" (a.k.a. childish adults playing tag in the woods at night). We're gonna have a blast. So my question is: Do you have a regular fun place to go in the summer? If not, what was your best summer vacation?